Mostly people call in for home delivery or take parcel. This place is not for those who like authentic Chinese food. I am sure most of us can't eat authentic Chinese food. The food here is full on desi style Chinese and is spicy. I love the noodles, Chilly Chicken, Spring rolls and my favorite crispy is honey chilli potato which is surprisingly not available in Mumbai. 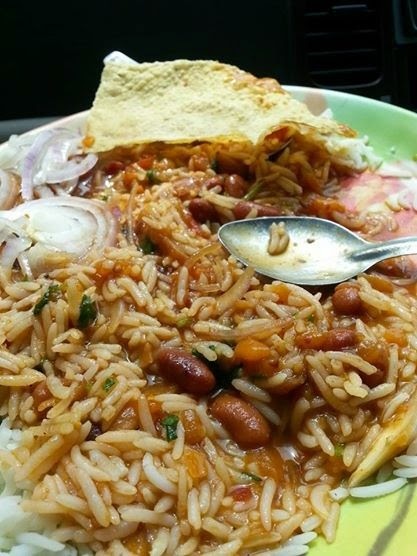 Anyways this post is not about the Chinese food it is about Rajma Chawal, yes you read it right Rajma Chawal. I was surprised when I got to know you get Rajma Chawal here in this particular place. So I went and gave it a try. They serve Rajma, Chawal, Fried Papad and Onions with Schezwan sauce. Vivvvvv we need to hang out together for 1 full day and go to all these cool food places you keep blogging about.....Chinese rajma chawal.....now really!!!! !